Ian Knox was born in Wilcannia in NSW on 9 February 1933, and attended the Wilcannia Primary School. He spent three years at Prince Alfred College in Adelaide from 1944 to 1946 before joining the Royal Australian Navy in January 1947. After graduating from the Royal Australian Naval College in October 1950 he undertook professional training at sea and ashore in the UK and Australia. He then served at sea until 1957 when he specialised in Torpedo and Anti-Submarine Warfare (TAS) in the UK (He was awarded the Ogilvy Medal for being Dux of the Commonwealth Long TAS Course). From 1960-63 he was the Anti-Submarine Warfare (ASW) Project Officer at the Aeronautical Research Laboratory in Melbourne during the development of the Ikara ASW Guided Missile System. After further postings at sea and on the staff at Navy Office in Canberra, he was posted as second in command of HMAS Perth and served in that capacity during the ship's first deployment to Vietnam in 1967-68. In 1968 he was promoted Commander and appointed Director of Underwater Weapons in Navy Office. He was the first Commanding Officer of HMAS Torrens when she commissioned in 1971. Knox attended the United States Naval War College at Newport, Rhode Island in 1972-73. On completion he was promoted Captain and assigned command of the Guided Missile Destroyer, HMAS Hobart. In 1975 he was posted to the Strategic and International Policy Division of the Department of Defence and was the Defence member of the Australian delegation to the third, fourth, fifth and sixth sessions of the United Nation Law of the Sea Conference in Geneva and New York. He attended the Royal College of Defence Studies in London in 1979 before being promoted to Commodore and assuming command of the aircraft carrier HMAS Melbourne. In February 1981, Vice Admiral Knox was posted as the Director-General Naval Plans and Policy in Canberra. Promoted Rear Admiral in 1982 he was appointed Chief of Naval Operational Requirements and Plans, and after two years was appointed Deputy Chief of Naval Staff. 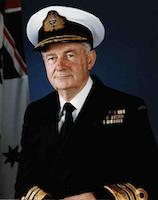 He assumed Command of the Fleet and Maritime Commander, Australia, in May 1985. In Januray 1987 he returned to Canberra as Assistant Chief of Defence Force (Policy). He was promoted Vice Admiral in July 1987 when he became Vice Chief of Defence Force. He was also Commander Joint Forces Australia in 1988-89 and commanded 25,000 personnel during the largest combined exercise in the SW Pacific. Since retiring from the RAN in September 1989 he has served on the Boards of Australia Sonar Systems, Oceanic Capital Corporation and Thompson-CSF Pacific Holdings. He was also a member for the NSW Legal Services Disciplinary Tribunal and the Dean of the Faculty of Economics, Sydney University, Advisory Committee. He joined Sydney Legacy in 2000 and is a legatee in the Mosman/Lane Cove Division. He obtained a pilot's license in 1988, a light aircraft the following year, and spent hundreds of hours exploring Australia by air before selling the aircraft in 1998. He was appointed an Officer of the Order of Australia (AO) in the 1985 Queen's Birthday Honours List and elevated to Companion of the Order (AC) in the 1989 list.